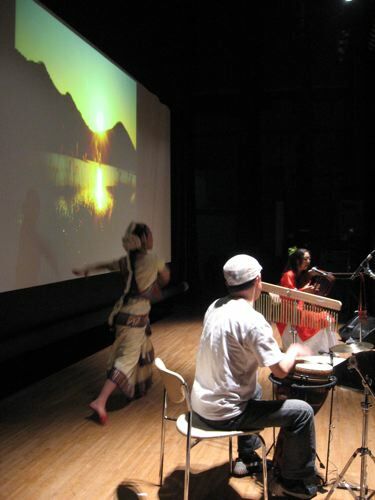 Posted on June 30, 2007 by Alicia Bay Laurel	in Blog and tagged travel diaries. Sachiho’s starring role today was in a show benefitting a Shinto temple, and in honor of its departed greatest teacher, whom she referred to as “my Shinto master.’ The widow of this teacher attended the show, and all of the performers in the show had studied with this teacher, whose name, alas, I did not write down. 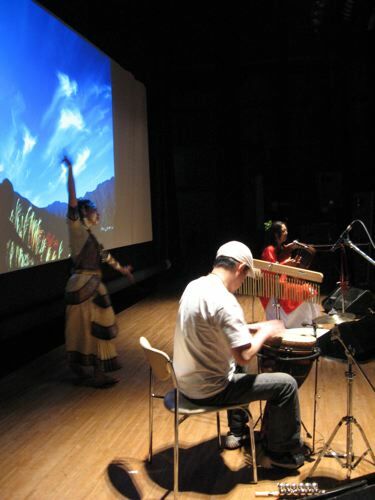 When we got to the theatre, Manami, a bharatanatyam dancer, was rehearsing onstage. 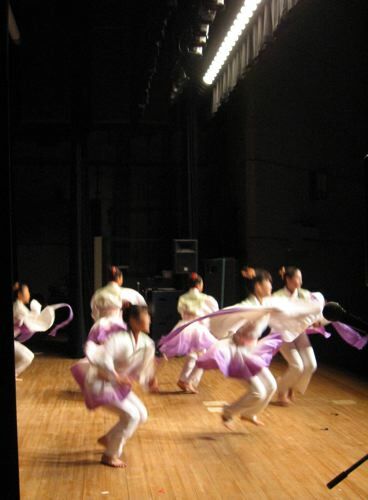 Next, a modern dance class rehearsed their two numbers, the first of which starred their teacher. 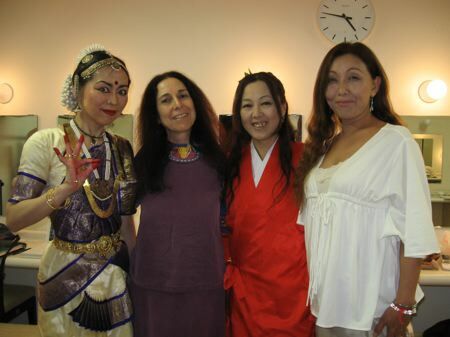 Backstage, I watched, fascinated, as Manami assembled her make-up, hair ornaments, jewelry and costume. 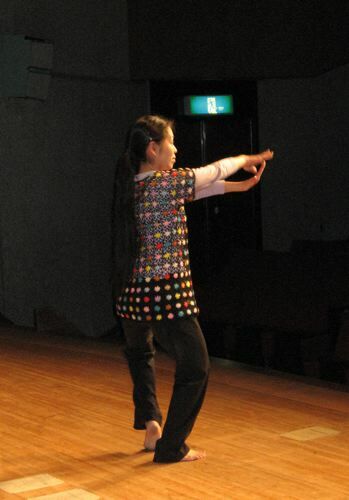 It took well over an hour for her to prepare for the stage. 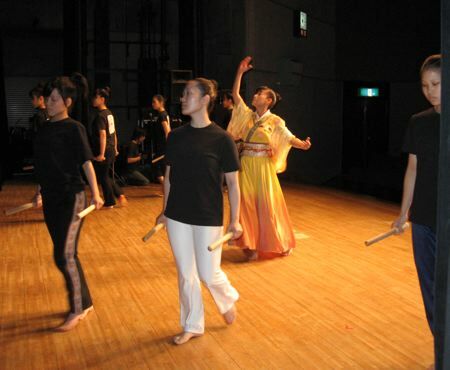 Sachiho’s preparation took a fraction of the time. She must have shipped her costume to herself at the theatre, because I’d certainly never seen it before in the several weeks we’d been traveling together. They both looked smashing when it was time for the show to begin. 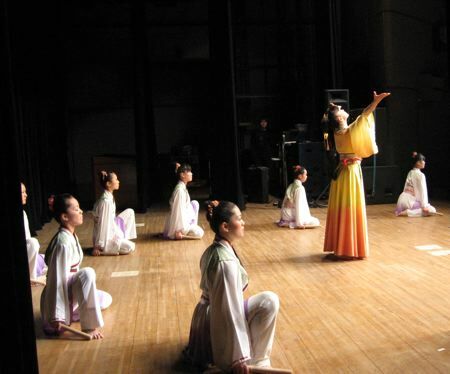 The show opened with the modern dance troupe in flowerlike handmade costumes. 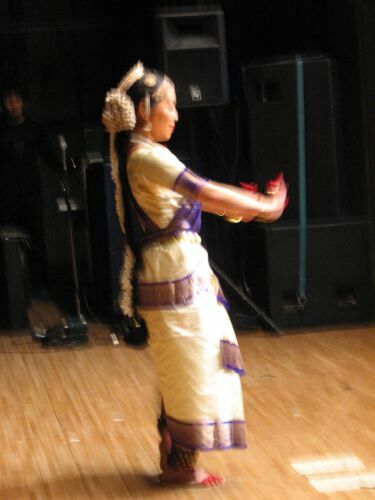 Next, Manami danced solo. 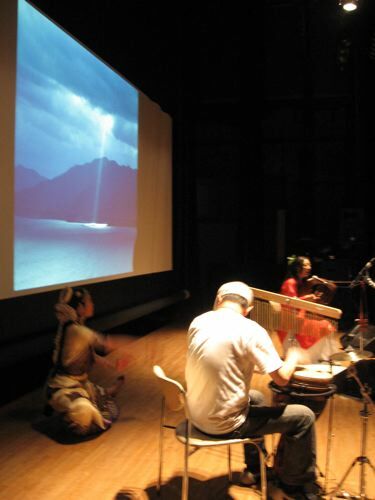 After that, she danced accompanied by Sachiho singing with her lyre in duet with a percussionist, while a talented nature photographer projected a long series of his works on a screen behind her. I don’t think my photos do this piece justice; it was really quite dramatic and splendid. 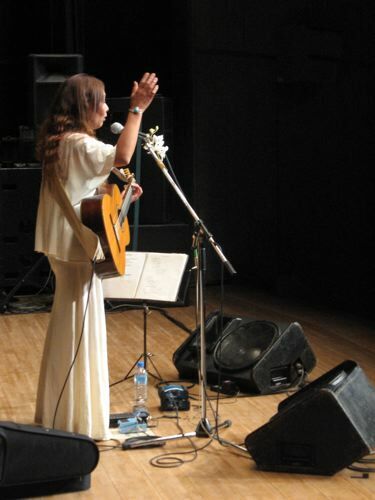 Last, Haruko, a singer/songwriter, performed. 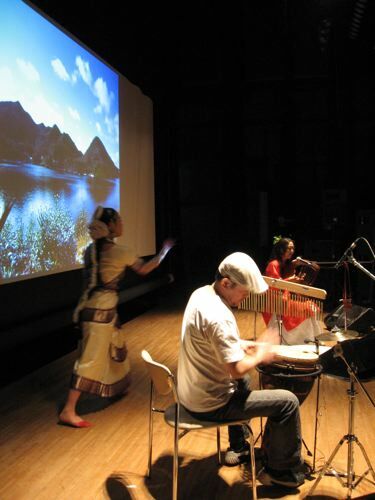 I had met her before on the Big Island of Hawaii in 2002 when Sachiho and her band Amana and about fifty fans of Sachiho’s departed rock star husband, Donto, came to Hilo for a memorial to Donto and a music tour for Amana afterward that I arranged. Haruko’s got sass. When she arrived backstage, she came bearing a dish she prepared from an octopus she had speared herself. 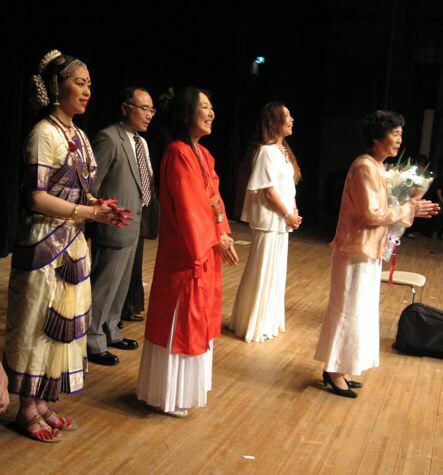 When the performers came out together to take their bows at the end of the show, they presented a bouquet to the widow of the great Shinto teacher. There was just time after the show for a little group shot backstage before everyone got back into their street clothes and we all went out for dinner at a restaurant at the top of a pachinko building near the theatre. That’s Manami, me, Sachiho and Haruko.